Kalalau Valley is one of my most favorite spots on the island of Kauai! The lush 2,000 foot cliffs rise above the beautiful natural flora and fauna of this State Park. When I painted this one, I realized that there was a face in the mountain side on the right side. See if you can find it! 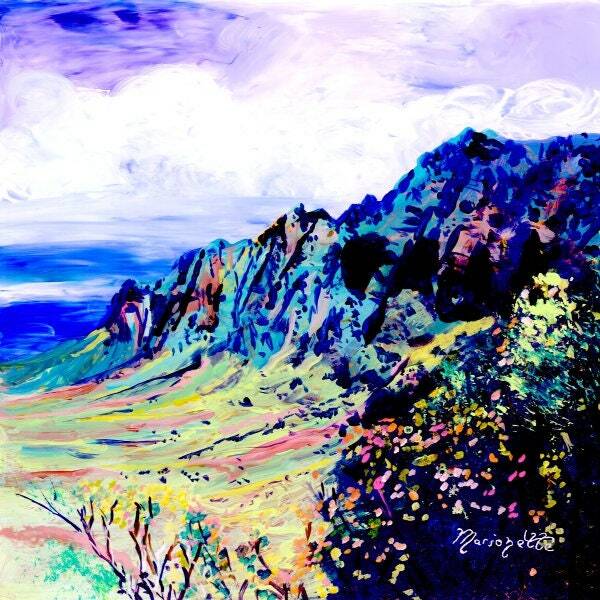 "Kalalau Valley 4" - This giclee print is signed by the artist and is printed with archival inks on radiant white watercolor paper. It is a reproduction of an original acrylic painting and comes packed in a clear sleeve with a backing board (unframed). Colors may vary slightly from monitor to monitor. My order came quickly, was wrapped beautifully/carefully & is exactly as pictured - It doesn't even look like a print, it looks & feels like an original. So, so beautiful. Marionette even sent me a bonus print as a thank you... The bonus print was the sea turtle which is the exact print I was struggling to choose between (that & Na Poli coast)! WOW!! I am so in love with them! Thank you!